There are holiday flights to/from Jersey in summer and Geneva in winter. south to Aviemore - Perth and then Edinburgh / Glasgow. Connections to Stirling as well. Savings within Scotland can be made with TravelPass & Rover tickets. For example the Highland Rover allows 4 days unlimited travel out of 8 consecutive days on Highland rail lines plus the Inverness-Fort William-Oban Citylink bus service. The Freedom of Scotland Travelpass allowing unlimited travel throughout the country on trains plus Cal Mac ferries and some bus services is available for 4 days travel out of 8 consecutive days (or for 8 days out of 15). For more details and prices see the special tickets page on the Scotrail web site. The Highland Caledonian Sleeper train operates from London to Inverness. For further details about UK trains, visit trainline for timetables and online booking. For day trips to Inverness & area from Edinburgh by coach - click here. For day trips from Inverness by coach to surrounding areas (Loch Ness, Skye, etc.) - click here. Megabus is a budget bus service operating between Edinburgh, Glasgow, Dundee, Perth, Aberdeen and Inverness. Departures from Inverness bus station. MegabusGold services offer free Wifi and complimentary refreshments, as well as bunks on overnight sleepers. The Scottish Citylink coach network operates the main routes between Inverness and other towns/cities in Scotland (e.g. 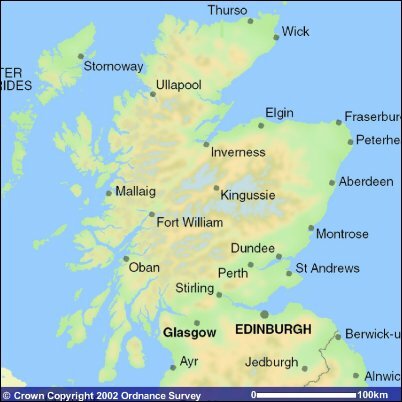 Fort Augustus, Fort William, Oban, Skye, Ullapool, Wick, Aberdeen, Perth, Edinburgh, Glasgow, etc.). Departures from Inverness bus station. You may be able to benefit from the Explorer Pass which offers for unlimited travel between certain dates. Discount tickets (Smart Cards) are available for travellers over 50 and for students aged 16-25. The Orkney Express Bus operates between Inverness and Orkney via John O'Groats. Every day from 1 June to 31 August 2019. Booking recommended. To calculate driving distances and routes from A to B, use the RAC route planner. Budget has cars and vans to hire from Inverness Airport. Sixt has cars and vans to hire from Inverness as well as Fort William, Aberdeen, Edinburgh and Glasgow. EasyDrive based in Inverness and has a wide range of hire cars, vans and people carriers. Local company with personal service. Drop-off available in Fort William, Edinburgh and Glasgow. Tel: 01463 712525. Focus offers vehicle hire from Inverness train station and airport. Includes 4x4, vans, minibus, etc. Tel: 01463 709517. Also available in Aviemore. Bespoke Car Hire Scotland can offer hire cars and people carriers. Available from Inverness airport, as well as Glasgow, Edinburgh, Aberdeen, Perth, Stirling, Prestwick (near Glasgow), Dumfries, Dundee, etc. Avis, Europcar, Enterprise also offer vehicle hire from Inverness city or airport. Happy Highland Campers - hire a fully equipped vintage VW Camper Van. Based near Evanton, about 20 miles north of Inverness. Pick up can be arranged from locations in and around Inverness. Bicycle hire also available. Tel: 07796 675639. Highland Campervans - offer 4-berth campers and motorhomes for hire. Automatic and 4-wheel drive. Based in Inverness. Tel: 01667 493976. OutThere Campervans offer a choice of campervans or motorhome. Based between Nairn and Inverness. Free transfers from Inverness Airport, railway or bus station. Tel: 07912 138727. Strathpeffer VW Campervan Hire have a range of T25 Autosleeper Trident campervans (sleeping up to 4). Based 15 miles north of Inverness. Tel: 01997 421195 / 07527 276894. Celia Ffitch-Stewart is a fully insured driver-guide with Mercedes limousine for your tailor-made guided tour. Half day, full day or extended tours. Airport collection (Edinburgh, Aberdeen or Inverness). Services can include itinerary planning and accommodation reservations. Meet your clan chief, trace your roots, stay in a castle, tour the distilleries. Member of HOSTGA (Highlands of Scotland Tour Guide Association). Can be booked if you are coming into Invergordon on a cruise ship. WOW Scotland (VisitScotland 5 Stars) offers guided private tours from Inverness and Invergordon (for cruise ship passengers). Shore Excursions offer half day and whole day sightseeing tours from the cruise liner port of Invergordon or from Inverness. Maximum 8 people. Car hire can be arranged from Invergordon for cruise ship passengers who would like to drive themselves. The Taxi Tour Experience is a taxi tour service for cruise liner passengers at the port of Invergordon (near Inverness). Each driver is a knowledgeable guide. Tours can include castles and distilleries in the Highlands, Loch Ness, Inverness, Culloden Battlefield. Minimum 3.5 hours. Choice of vehicles including multi-seaters for up to 8 people. Click here for more private tour guides who operate from Inverness and the Highlands. Inverness Taxis have an excellent reputation in Inverness. Available for airport pick ups, weddings, personal sightseeing tours, etc. Disabled facilities. Tel: 01463 222222. Cinebus - transport by 7-seater minibus. Ideal for those nights out when you don't want to drive. Available from Inverness, Dingwall, Alness, Invergordon, Tain, etc. for transport to Eden Court, Vue cinema, Rollerball, etc. or for birthdays, hen and stag nights, Christmas. Also airport and rail connections. Contact Nigel Newell - tel: 01862 842260. Inverness Limos offer chauffeur driven white limos in Inverness and the Highlands. Great for weddings, parties, etc. Telephone: 07473 300902. J A Johnstone Chauffeur Drive offers a full range of chauffeur driven services by car or 6-7 seat people carrier for individuals or small groups. Available for business trips, sightseeing tours, etc. Over 20 years experience. Highly recommended. Member of the Highlands Of Scotland Tourist Board and the American Society of Travel Agents. Credit cards accepted. Tel: 01463 798372. Taxi to/from Inverness (ideal for sightseeing) Destinations include Aviemore, Strathpeffer, Dingwall, Ullapool, Alness, Invergordon, Tain, Portmahomack, Lairg, Wick, Thurso, etc. Also John O' Groats - Inverness taxi service. Andrew's Car Private Hire is licensed for up to 6 people. Andrew McCallum covers all areas around the Black Isle, Dingwall and Inverness. Airport pick ups, tours, etc. Mob: 07818 697 609 / Tel: 01349 877 547. North Coast 500 Moto Experience is a motorbike hire company based on Harbour Road in Inverness. If required they can meet you at Inverness Airport (fee applies) or Inverness Train and Bus stations (free). Tel: 01463 231212 / Mobile: 07751519101. Bike hire is available from Highland Motorcycle Holidays based in Invergordon. They can also arrange itineraries and biker-friendly accommodation in the Highlands if you are visiting on your own bike or hiring one from them. Contact Nigel Newell - tel: 01862 842260. Mitchells Motorcycles in Grieg Street, Inverness offers spares, repairs, accessories, etc. Tel: 01463 233 478. Based at Bellfield Park in Inverness, A Ticket to Ride offers bike hire (road, mountain, hybrid, tandem, kids, electric). Helmet, lock, toolkit and emergency assistance all provided. Day trips with route maps are available (e.g. Loch Ness, Culloden & Cawdor). Cross country routes can also be arranged. Bike taxi service available (e.g. John o'Groats, Kyle of Lochalsh, Fort William). One way hires available on the Great Glen Way (Inverness-Fort William). Tel: 01463 419160. Caledonian Gifts at 12 Church Street in the centre of Inverness have cycles for hire by the day. Tel: 01463 710 664. Inverness railway station operates part of the Bike & Go scheme (annual membership required).